For the first time in many decades socialism matters. The largest socialist group in the US is Democratic Socialists of America. That’s why what DSA does matters also. Below is a report from a meeting of the East Bay DSA. The panel of teachers introduced themselves. Then the co-chairs asked them a series of questions, after which members of EBDSA would be allowed to ask questions; no comments permitted, just questions. The questions from the co-chairs started out with asking the teachers what they liked about teaching. In other words, the questions were basically apolitical. This part of the panel discussion continued at great length and shed little light on what is or has been happening in Oakland schools or within the union. The numerous questions submitted by the co-chairs lasted so long that it was necessary to extend this agenda item for about double the time allotted. Eventually the floor was open for members to ask questions. Irene was recognized. Frustrated at that point, she was a bit emphatic in her comments, the main point of which was that this is not just a local struggle of a group of workers against a particular management; it is part and parcel of the international class struggle. She was cut off again, because she was making a statement, not asking a question. Then a male comrade got up and made an extended comment about how a member of the state legislature, Buffy Wicks, had been one of the speakers at the teachers’ rally the previous day and that Wicks is supported by the school privatizers. Whoever invited her to speak is the “fifth column”, the representatives of the enemy within the ranks of the teachers, was his point. We completely agree with his point, but how is it that the chairs permitted a male comrade to make a comment rather than ASK A QUESTION and was not cut off as Irene was? This double standard did not go unnoticed by many in the room. This portion of the agenda contrasts with what we were trying to do with the resolution to start building towards a working class party. The purpose of the resolution was to suggest a different approach for EBDSA and, in the course of it, to at least open up a serious political discussion/debate in the branch. The resolution points out that the main emphasis of official activity of EBDSA has been almost exclusively around elections and legislation. This has never been the main avenue of struggle historically for the US working class, and states that a mass working class party is desperately needed in the US. 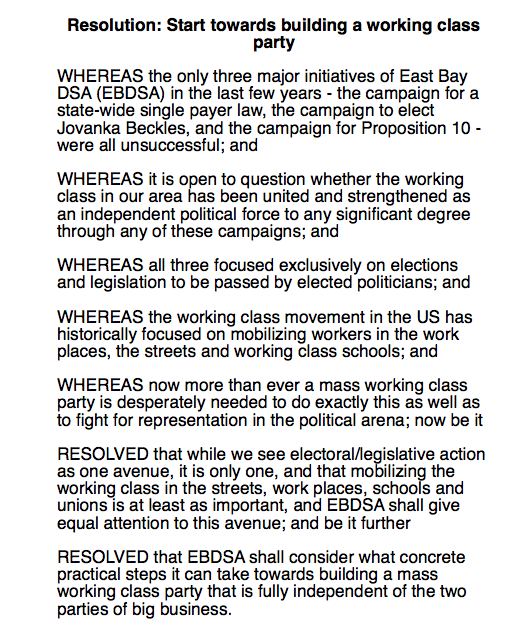 It proposes two main things: (1), that EBDSA give “equal attention” towards trying to mobilize the working class in our area; and (2) that EBDSA shall consider what concrete practical steps it can take towards building a working class party. After a short presentation, which the timekeeper tried to make even shorter, a “question” period was opened. Only two people spoke on the actual resolution. One claimed that the resolution called for DSA to establish itself as a political party. There is nothing in the resolution that even remotely implies that. The second person spoke. He commented that there are some people on the left for whom nothing is good enough. He accused us of having the position that nothing short of the all-out revolution is adequate. As was so for the claim of the previous speaker, This is a clear misrepresentation of the resolution as anybody who reads it can see. The leaflet makes that even clearer. Together they simply say that the traditions of the US working class are mass mobilizations and militant strikes, that it is out of a return of those traditions that a working class party can arise, and that EBDSA should encourage a return to those traditions. Immediately after this individual spoke, a motion was made to end debate. A number of people had their hands raised to speak but nobody supporting the resolution was called on. The two members who were allowed to speak from the floor completely misrepresented what the resolution called for. Then the question was called before a debate even started. Anyone who has been an active rank and file union member recognizes this method. It’s the same one used by the union bureaucracy to minimize, demoralize and ultimately drive out any member who dissents from their policies. That is especially so when these policies are completely contrary to the members interests, such as forcing a concessionary contract down their throats. This lack of democracy and the devastating results have contributed to the demise of union membership in the US. At EBDSA’s last annual membership convention, the chair of that convention commented excitedly, “this is really important to have a political debate for the first time.” The January EBDSA meeting shows why and how such political debate is stifled. From start to finish (nearly) the general atmosphere is one of a college pep squad rally, together with a completely apolitical approach to important issues (the situation for Oakland teachers). It is easy to see why, in this sort of atmosphere, serious discussion and, yes, even debate is unwelcome. These are the methods of the union bureaucracy. The reason they have adopted these methods is that their strategy – timid, employer friendly practices on the job and tailing the liberal Democrats politically – have been a disastrous failure. They have been a disastrous failure for workers throughout the United States and, because the union bureaucracy is determined to continue down this road, they must stifle serious debate. There never will be a serious, working class socialist movement built that mimics – and in some cases is even worse than – this approach. We urge fellow DSA members to consider these points and to speak up. The background of the three presenters of the resolution is also relevant. Irene Kellogg is a Haitian/American who was was a bilingual educator and organizer in the Haitian community in New York City. She still maintains her membership in the United Federation of Teachers. Cheryl Zuur was an active member of the Hotel Employees and Restaurant Employees union in San Francisco and then of the primarily male, blue collar AFSCME Local 444, of which she was president. She has a long record of fighting for her members and opposing the union bureaucracy. John Reimann was a shop steward and also was recording secretary of his local – first Carpenters Local 36 and then Local 713 and was the chairman of the strike committee that ran the 2,000 member SF Bay Area carpenters wildcat strike of 1999. Collectively, we have nearly 100 years of very varied experience as active rank and file members of our unions. This collective experience was silenced by the defenders of the union bureaucracy – the same bureaucracy that has led the labor movement to its sorry present state of affairs. Oaklandsocialist comments: Since this was written, one of the authors – John Reimann – has tried to get DSA to organize protests against the government shutdown. These protests should link up opposition to the shutdown with opposition to the Wall. Those few DSA members who commented were opposed to this. Again, this shows how support for the “progressive” Democrats like Bernie Sanders leads socialists to oppose taking up the traditional methods of the working class. Failure to do this leads to allowing the approach of Bernie Sanders to go unchallenged. This approach is to simply sign an online petition pressuring Senator Mitch McConnell. Nor is this simply a problem of EBDSA. Here is a video we did about having been banned once before, this time by the national DSA. 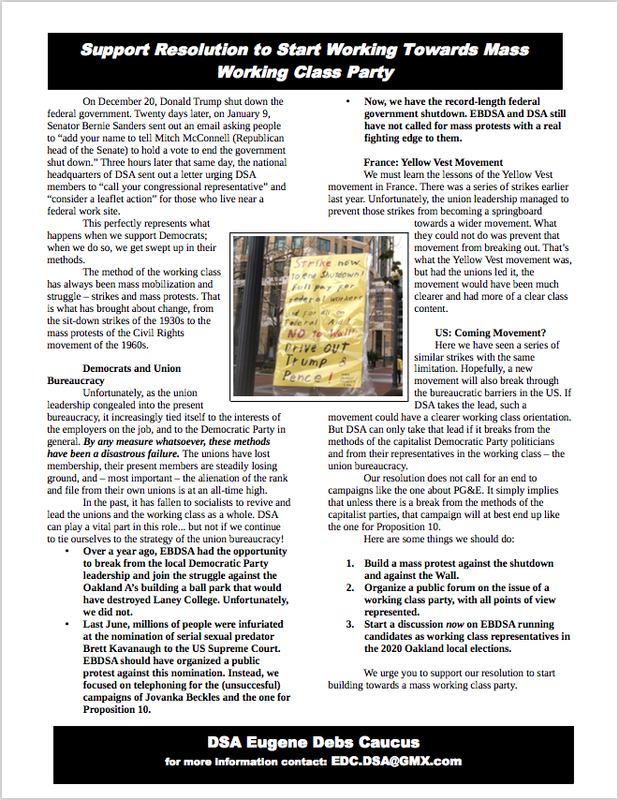 And if you would like to know more about the Eugene Debs Caucus, here is an article on that, along with some documents of the caucus. How many members of DSA actually indicated support for the resolution? I’m guessing that about 20 or 30 voted against shutting off debate and about 10 or so voted in favor of the resolution. Where is the video mentioned at the end of the document? I really was hoping to see it. Regarding you comment,:… one of the authors – John Reimann – has tried to get DSA to organize protests against the government shutdown. These protests should link up opposition to the shutdown with opposition to the Wall…” I must say, it is about time. As one who attended the Oakland rally I have seen very few, if any, left forces talking about the shutdown and the Wall, and the attack on the working class and immigrants that this poses. I remain shocked, but I realize now that those of us who see this for what it is must sit down, lay out strategy, develop the proper tactics, and get to work. All of this – the children still separated from their families, the workers sent home on furlough, the teacher’s strike and struggles…of of this is a result of the capitalism we live under in this critical period. It appears that DSA has its contingent of enemies of the working class right within it.If so, they must be organized against and defeated politically. Housingisaright: To see the video, click on “video” where it says “Here is a video”. It’s a hyperlink.